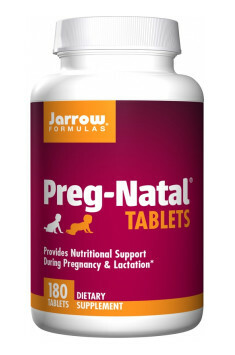 Preg-Natal® from Jarrow Formulas is a dietary supplement containing in its composition the complex of mineral ingredients and vitamins essential to maintain health of pregnant women and during lactation. Certain microelements are essential for the proper development of the fetus, which prevent birth defects of the immune, nervous and skeletal systems. Breastfeeding mothers also need to comprehensively take care about fulfilling nutritional needs to make milk nutritious and full of all necessary nutrients essential for the development of a child. The product Preg-Natal® contains all micro and macroelements complementing daily menu in the necessary ingredients and it constitutes a great additive in order to support a diet of a young mom. The product contains the best and the most bioavailable forms of B-group vitamins and folate, which skip problematic and complicated transformations taking place in the organism. Thanks to this, they are totally safe, both for a child and for a mother. Vitamin A - in combination of beta-carotene and retinol, a vitamin soluble in fats, belonging to the group of retinoids. It is essential to maintain proper vision and health of eyeball. It demonstrates strong antioxidant properties and protects cells from the harmful influence of free radicals. Vitamin C - called ascorbic acid, one of the strongest antioxidants. It takes part in the synthesis of collagen – a protein taking care about healthy bones and joints. It regulates the functions of the immune system and strengthens organism’s immunity. Vitamin D3 – cholecalciferol, a vitamin playing a role of a pro-hormone in the organism. It is synthesized in people thanks to the activity of sunrays. It regulates calcium-phosphorus balance, preventing rickets in children and osteoporosis in adults. Moreover, it is very important to regulate the immune and hormonal system. Vitamin E - a group of chemical compounds, in the composition of which there are tocopherols and tocotrienols. It belongs to the substances soluble in fats with antioxidant effect. It influences fertility in men and health of the cardiovascular system. Vitamin K - the combination of vitamin K1 (phytomenadione) and K2 (menaquinone), which is reflected in high assimilability in the digestive tract. This vitamin is soluble in fats, takes part in regulating the level of calcium in blood. It is responsible for redirecting and setting calcium circulating in the plasma to bones, which prevents atherosclerosis and positively influences strong skeletal system in children and adults. Vitamin B1 - thiamin, normalizes the functions of the nervous system, toning nerves and decreasing stress. It improves memory and concentration, work of heart and accelerates would healing. Vitamin B2 - riboflavin, similarly to other B-group vitamins, it is soluble in water. It takes part in the transformations of carbohydrates and lipids into energy, positively influences the development and functioning of the nervous system. Vitamin B3 – niacin, takes part in the creation of erythrocytes, regulates lipid balance, lowering the level of cholesterol LDL and triglycerides. Vitamin B6 - in the highly assimilable form of pyridoxine hydrochloride, takes part in the creation of lymphocytes, therefore it increases natural functions of the immune system. It decreases blood pressure and regulates heart work. Folate – in a safe and the most bioavailable form of methyl-tetrahydrofolate, constitutes an essential ingredient for the proper development of the fetus, prevents developmental defects of the immune and nervous system. It takes care of maintaining genetic material, sustaining pregnancy and proper development of brain functions. Vitamin B12 – also called cobalamin, in the supplement in the methylated form – methylcobalamin, enabling full utilization and bioavailability by the organism. It takes part in the production of red cells, therefore its deficiency leads to anemia. It is an important coenzyme in the synthesis of homocysteine to methionine, takes part in the production of neurotransmitters, especially serotonin in the brain. Biotin – takes part in the production of glucose, positively influences the condition of hair, nails and skin. It supports the production of free thyroid hormones T3 and T4. Pantothenic acid – an essential ingredient of food, which needs to be provided from outside. It takes part in the metabolism of carbohydrates, lipids and amino acids, influences healthy cardiovascular system and regulates the functions of the nervous system. Calcium – a basic building block of bones and teeth, its proper concentration prevents injuries and osteoporosis. It takes part in the production of neurotransmitters, hormones and regulates blood coagulation. Iron - an essential ingredient of hemoglobin, its deficiency leads to dangerous anemias. It conditions proper development of the fetus and prevents congenital disorders. It strengthens immunity and helps to decrease damages caused by free radicals. Iodine – an essential microelement, takes part in the production of thyroid hormones T3 and T4. Fetus derives iodine from the mother in order to produce its own thyroid hormones, therefore during pregnancy, supplementing this element is essential to maintain health of a child. Magnesium – an essential microelement, regulating the functions of the nervous system. It strengthens memory, concentration and prevents depression, insomnia and cardiovascular system diseases. Zinc – a chemical element taking care about proper immunity of the organism and bone mineralization. It influences fertility, skin condition and lipid balance. It regulates the secretion of insulin from the pancreas. Selenium – a microelement with strong antioxidant and anti-inflammatory effect. It is essential for the proper functioning of thyroid and the immune system. Copper – takes part in the creation of erythrocytes, therefore it is essential for people with anemia. It is the component of SOD – superoxide dismutase with a strong antioxidant effect. It regulates heart work and decreases blood pressure. It is important for proper bone mineralization. Manganese – a trace element stored mainly in the liver and kidneys. It demonstrates positive influence on the functioning of the nervous and digestive system, increases libido and is an important ingredient of bones. Chromium – a chemical element, regulating glycemic balance – it lowers the level of insulin and glucose in blood. Moreover, it decreases the level of LDL cholesterol and triglycerides. It inhibits appetite for sweets. Potassium – belongs to electrolytes, takes part in the transformations of carbohydrates, lipids and amino acids. Regulates the work of the heart and muscles, influences water balance of the organism. Choline – also called vitamin B4. A form used in the supplement (choline bitartrate) increases its level in the plasma, conditioning all the benefits for the functioning of the brain. It is a precursor of acetylcholine, a neurotransmitter, responsible for good memory, concentration and proper cognitive functions. It is incredibly important for pregnant women and children, as it reduces the risk of birth defects, supports the transport of nutrients through placenta and conditions proper development of the central nervous system in the fetus. Lactoferrin – a protein from the group of transferrins, appearing in largest amounts in colostrum and mother’s milk. One of the most important ingredients for a child, demonstrating antifungal, anti-inflammatory, immunomodulating and antiviral effect. It supports natural immunity of a child and shapes its immune system. Inositol – also called vitamin B8, supports the production of such hormones as TSH and GH. It regulates glycemic balance, decreasing hyperinsulinemia, especially problematic in polycystic ovary syndrome (PCOS). Ginger root - demonstrates strong anti-inflammatory effect, alleviates ailments of the digestive system and decreases plaque aggregation, preventing the creation of, i.a. atherosclerosis. Lutein - influences health of eyeball, protects from the harmful influence of free radicals on eye retina. Silicon – a chemical element, supporting health and strong bones, joints and ligaments. It supports proper functioning of the cardiovascular system. To sum up, Preg-Natal® from Jarrow Formulas is a professional dietary supplement, complementing daily diet in all nutrients and elements, essential for the proper functioning of the fetus and supporting women during lactation. The product is rich in iron, choline, lactoferrin and folate in highly bioavailable and safe forms, which are necessary to maintain health of the immune system and the central nervous system of a child. Take 6 tablets per day, in divided intakes, or as directed by your qualified healthcare professional. The supplement is additional support in the form of the complex of vitamins, microelements and trace elements, essential to maintain health of a breastfeeding mother and a child. However, the basic source of all the nutrients should be a well-balanced diet. Hydrolyzed bovine collagen, methylsulfonylmethane, natural vanilla flavor and a food-grade coating. Lactoferrin - a protein classified to the group of transferrins, naturally occurring in glandular secretions, such as saliva or milk. Its especially high concentration is noted in colostrum and mother’s milk. It takes part in shaping non-specific immunity. It demonstrates a wide scope of immune functions, has antibacterial, antiviral, antifungal, anti-parasitic and anti-inflammatory properties. The properties of lactoferrin are noticed not only in relation to body fluids, but also in case of its supplementation. Therefore, supplements with lactoferrin are used in order to improve immune functions of the organism. This protein is especially effective in the fight with viral infections. Moreover, lactoferrin demonstrates the ability to chelate iron ions, which also demonstrates positive influence on the immune functions. It also stimulates phagocytosis and has immunotropic effect.